Recently came across a mention about SQL Search developed by on the SQL Server Central Site. I decided to check it out, downloaded the software from the red gate site(www.red-gate.com). 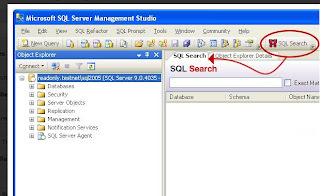 Once SQL Search is installed, at the end of the installation there is a mention to open Sql server management studio. Once i opened the SSMS and connected to the server, there is a icon in the toolbar called SQL Search. Once you SQL Search it opens up a window like the one shown below. 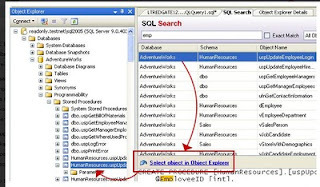 The sql search window is split into two, on the top window, the term to be searched is entered in the textbox on the left hand side, in the next dropdown choose the kind of object (like tables,stored procedures,views) where the term need to be looked up, in the next drop down choose the database where term has to be searched. Once you start typing the word like product, the tool starts displaying objects that contain the term. When you click on the detail row, if the detail row is a table the control shifts to the object explorer where the table is present, if the row is a stored procedure or trigger, the text containing the term is displayed in the bottom window. In a nutshell SQL Search is a very helpful and intutive tool for database developers and administrators.